The Etios is expected to cost well under $10,000. Toyota Motor Corp. unveiled its new strategically important car for emerging markets at the Delhi auto show on Tuesday. 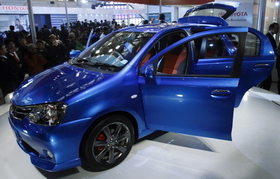 The company plans to sell the low-cost Etios compact car in markets such as India, Russia and Latin America. India and other emerging markets are quickly replacing major Western markets as a key battleground for auto firms. "India will play a pivotal role in Toyota's global expansion plans and the time has come for us to strategically accelerate our growth here," Toyota Vice Chairman Kazuo Okamoto told a media conference. Driven by the world's second-largest population, government incentives and a relatively strong domestic economy, Indian auto sales are set to grow about 16 percent this year to 1.4 million vehicles, after posting double-digit growth through most of 2009. "With the introduction of Etios, we hope to attain a sizeable market share in India in the shortest possible time," said Sandeep Singh, deputy managing director of marketing at Toyota's local unit, Toyota Kirloskar Motor. Toyota said more than 2,000 engineers in India and Japan worked for four years on the Etios, which is code-named EFC for entry family car. The company did not specify a price range for the new model, which is expected to sell for well under $10,000. Toyota expects annual sales of 70,000 units of the Etios in India as it looks to ramp up growth in the fast-growing market. Toyota will expand its Indian sales network to 150 dealers by the end of 2010 from the current 97. The Etios is due to go on sale later this year. Toyota is a laggard in India, Asia's third biggest economy, and is facing increasing competition from rivals targeting one of the few bright spots in an industry ravaged by the global financial crisis. Toyota began producing cars in India in late 1999 and built just 51,133 cars in the country in 2009.